where the paper was protected by an overlap at the seam. In early colonial America, wallpaper was used by the more affluent but in the more unimportant rooms of homes. Rooms like the drawing and dining room and ballroom were covered with fabric in strips or panels with fancy cording or wood framing to hide the seams. By 1712, when wallpaper had become popular in the colonies, the English introduced a tax on any paper that was "painted, printed or stained to serve as hangings." To get around the taxes, artists hand colored wallpaper after it was hung on the wall. The industry grew and in 1773, Parliament repealed that tax, but still levied custom duties. Many wallpapers of that time were predominently blue in color because indigo, the source of the color, was one of the few crops not taxed by the English. In the early 1800s, falsification of wallpaper customs stamps was a crime punishable by death. 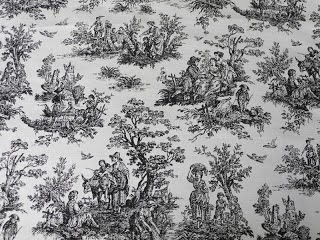 Popular toile pattern usually printed in blue, red, or green. One type of wallpaper made during colonial America was a form of stenciling. A wood block was carefully prepared in relief, which means the areas to show “white” are cut away with a knife, chisel, or sandpaper leaving the characters or image to show in “black” at the original surface level. Artisans would apply ink to the block with a roller and bring it into firm and even contact with the paper or cloth to achieve an acceptable print. The content would print “in reverse” or mirror-image. Multiple blocks were used for coloring, each for one color. Often, a simple design was block printed, and an artist embellished the design by hand. The earliest known fragment of European wallpaper that still exists today was found on the beams of the Lodge of Christ's College in Cambridge, England, and dates from 1509. In 1785, the first machine for printing colored tints on sheets of wallpaper was invented, and a patent was registered in 1799 for a machine to produce continuous lengths of paper. 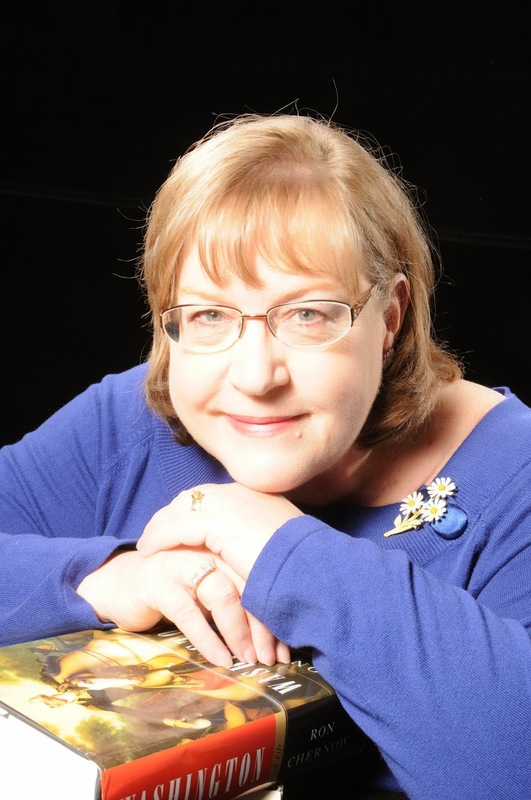 Susan F. Craft is the author of The Chamomile, an inspirational Revolutionary War romantic suspense that takes place in Charleston, SC. Lilyan Cameron, the heroine of The Chamomile, is a wallpaper and portrait artist. The Chamomile won the Southern Independent Booksellers Alliance Okra Pick award. Susan is represented by the Hartline Literary Agency. Susan, this was so interesting. I can't imagine hand coloring wallpaper, but people will do anything to get around taxes. I seem to recall that the wallpaper in Williamsburg was mostly blue. Now I know why. Thank you, Margaret. I guess the hand painting was similar to painting a mural only in a continuous pattern instead. Regarding the indigo, not only was it not taxed, the king paid extra for colonists to grow it (especially in South Carolina where I live) in order to compete with the French who wanted a monopoly on what was a huge cash crop for them. Enjoyed this, Susan. Handpainting wallpaper??? Oh my! Funny, Pam. I can picture it. Looking at the details of these wallpaper prints, it's hard to imagine someone carving a block of wood so intricate. And hand painting--that must have taken a long time. Do you know much about wallpaper used in 19th century America? Vickie, the heroine of my Revolutionary War novel, The Chamomile, is a wallpaper, mural, and portrait artist, so I did extensive research on wallpaper of that era. Although my research included books about the history of wallpaper, beginning in China, I concentrated on the 1700s. So, I don't know much about wallpaper in the 19th century. Fascinating post, Susan. I've seen some of the old scenic wallpapers while on old house tours. Just beautiful! Glad you enjoyed the post, Susan. They were artisans who took great pride in creating something special. Susan, you always manage to write about the most interesting things! I really enjoyed learning about wallpaper in Colonial times. Those taxes, but necessity is the mother of invention. Thank you, Carla. The colonial Americans were ingenious at getting around taxes! Yep, the Brits were serious about taxes and fines and disobedience. I read and enjoyed THE CHAMOILLE. Like your wallpaper designs. Such a nice thing to hear, Sharon, that you enjoyed The Chamomile. I'm smiling. Thank you.